Diana D’Achille is UX/UI Designer with a passion for creating eye-catching user friendly experiences. Diana is currently a Senior Brand Visual Designer and Creative Lead for Verizon’s Personalization team. She has worked on numerous innovative projects and have been responsible for many of the visual elements on the Verizon’s website. Her assignments have included homepage marquees, landing pages, UI concepts, UI redesigns, and lead designer for many of Verizon’s campaigns and device launches. Born and raised in Denville, New Jersey. Diana was exposed to art and technology at a very young age. Her father is a computer science professional, so she has always been exposed to the newest innovations. Diana’s Grandmother is a talented fine art painter; a dedicated artist who works long hours. Having the opportunity to attend many of her grandmother’s art shows is what gave Diana her initial interest in art. Diana states “the combination of mixing technology with art is fascinating because it has no limits, the pos­si­bil­i­ties are end­less”. Diana enjoys the challenge of staying on top of the forever changing edge of technology. She is currently attending Quinnipiac University working towards her Masters of Science in User Experience. Diana has also earned a Mini Masters User Experience Certification from Rutgers and completed a Web Master’s Certification from the County College of Morris. Diana received her undergraduate degree from Marywood University with a BFA in Graphic Design and a minor in Multimedia while competing in two varsity sports; cross country and lacrosse. She is always looking to learn something new. When Diana is not sitting at her desk designing, you can find her releasing energy in a physical activity. 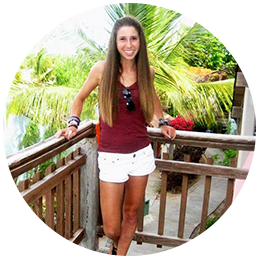 She loves the outdoors, being around people, spending time with her dog, and competing in 5k races for charities. Diana contributes her positive and energetic personality from eating healthy and staying fit. Her most creative ideas are found on her daily runs. She also feels her past involvement in sports has taught her the importance of time management, discipline, and perseverance; qualities that every designer should possess. Get in contact with her today. The combination of mixing technology with art is fascinating because it has no limits, the pos­si­bil­i­ties are end­less.